Just when one thinks they have seen it all, something comes along challenging our complacency. That something for cylinder enthusiasts was the recent find of what may be the last copy of a failed 1902 experiment in sound recording: A huge 5-foot long cylinder nicknamed "Brutus". Uncovered by record collector, Tyrone Settlemier, and wax cylinder recording preservationist, Glenn Sage, the Brutus cylinder was displayed for public viewing at the "Sounds of Nostalgia" antique phonograph show held in Salem, Oregon. 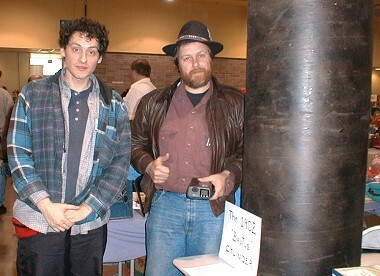 Brutus discoverers and researchers Glenn Sage and Tyrone Settlemier. Show attendees were wowed by the larger-than-life cylinder and received information about its possible past (see the backgrounder article, The Bell-Bettini-Marconi-Neuman "Brutus" Cylinder of 1902, at right). Is the Brutus cylinder a 1902 attempt, gone terribly awry, to push the envelope of sound recording technology, or is it perhaps simply a spray-painted cardboard packing tube? Whatever the case, as more than one veteran phonograph collector was heard to utter  "That's a big cylinder." At over 5' tall and 22" in diameter, the so-called Brutus cylinder is a wonder. The cylinder exhibited before you may be the only one of three such cylinders manufactured by the US Everlasting Company in 1902. Although facts surrounding the history of this odd chapter in the sound recording industry are hard to come by, it is thought that in late 1901 or perhaps early 1902 Everlasting sought to create the ultimate record. To that end, Everlasting secured four industry greats  Alexander Graham Bell, Gianni Bettini, Guglielmo Marconi, and Alfred Neuman  to develop the record with a goal to unveil the new format at the grand opening of the Flatiron Building in New York City. Aiming for playback volume rather than convenience, and revolving at a daring 160-RPM, the development team created this, the world's largest cylinder record, nicknaming it the "Brutus" cylinder. With its unprecedented surface speed and spacious 13 grooves per inch (yielding a maximum recording of just over two minutes), the Brutus produced by far the loudest sound recordings of its time. Unfortunately, the ambitious experiment was doomed to failure. Centrifugal forces caused chunks of the wax recording surface to fly off the record on its maiden showing. Sadly, the cylinder caused several minor injuries and considerable property damage before it could be stopped. The resulting lawsuits eventually led to the dissolution of Everlasting, making it the only company shut down by a legal battle not brought on by Victor, Edison or Columbia. 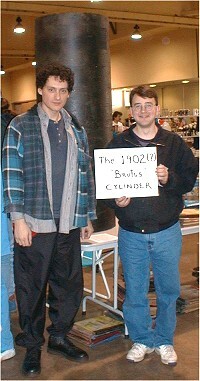 What became of the inventive team behind the Brutus cylinder? Bell, fearing bankruptcy, turned all his assets over to his mother (from whence the term "Ma Bell" is thought to originate). Marconi became so completely disillusioned after this his second failure in the record industry, that he threw himself completely into development of a medium to destroy the phonograph  radio. An emotionally scarred Bettini returned to Europe, abandoning his New York phonographic enterprise. Neuman, after bouts of madness, channeled his energies into the world of publishing. This, possibly the only extant example of a Brutus cylinder, will be available for bids (plus shipping and handling). Fashion wizard, Glenn Sage (left), stands with record collector and the chief archivist with WAMS (Wolverine Antique Music Society), Gus Frederick (right), who signals his approval of the impressive Brutus. Members and friends of the Oregon Territory Antique Phonograph Society attending the "Sounds of Nostalgia" show in Salem, Oregon. 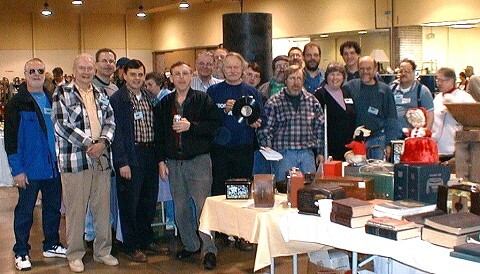 From left to right (front row) Richard Gass, Bob Reynolds, Bob Thomsen, Don Fenske, John Hoffman (holding an Edison diamond disk), Mike Stitt, Dona Miller, Prof. Stan Stanford, Harvey Kravitz, Vicki Pittaluga (wife of the late Joe Pittaluga); (middle row) John Curry, Betty Cannon (wife of the late Bud Cannon), Dale Lorang, Tyrone Settlemier, Darrell Lehman, Steve Slocum, Glenn Sage; (back row) Jerry Blais, The Brutus cylinder, Brice Paris. Not pictured:	Harold Braker, Edward DeVito, Omer Devlin, Charlie Dewile, Jon Graham, Bob Johnson, Pat Jones, Becky Palmer, and Rick & Suzi Terrell.